HAPPY 1ST BIRTHDAY PRUDENT BABY!! We can’t believe it’s been a year. We’ve had so much fun. So we thought, what better way to celebrate than… a trip to Mexico without our husbands and kids! And then our backup plan was… a DIY on icing a birthday cake! Hmn, doesn’t seem like such a worthy replacement for that trip anymore. Regardless, if you are a mom, baking a cake has come up. And if you are more of the “DIY” type than the “swing-by-the-bakery” type, this little walk-though might come in handy. And if you are a professional, or just an awesome cake decorator, don’t laugh at my skills. I’m definitely just a home baker with a few lessons under my belt. But with these tips, you CAN ice a perfect cake, if you’re into that kind of thing.I’m more of a half-perfect kinda gal. Click here for How to Ice a Cake. So let’s start with a cake, you will need one of those. I toyed with the idea of baking from scratch but time was tight (isn’t it always?) so convenience won out. Plus, I’m a pretty big fan of the cake mix, I cannot lie. Those Duncan Hines people know what they’re doing. So grab a box and a few cake pans. These are Magic Line brand, 8″x2″ rounds. I really, really, love these pans, See those sides that go straight up? You want those. Ok, so even though I love the cake mix, I make a tweaks to the “recipe” which makes the cake just a little more delish and easy to work with. I simply add one more egg and 2 tablespoons flour to the ingredients. Prepare those babies as directed. Oh, but cook at 325 rather than 350 and use the toothpick method to test for done-ness. Ill also touch my fingertip to the top and if the cake springs back, it is done. Your cakes are baked and cooled on a rack. If you aren’t going to use them right away, wrap them for freshness. This cake doesn’t have to travel so I’m just going to decorate it right on an 8″ round cake board. If you need to transport, use a foil-covered cake board in a slightly larger size than your cake and proceed. If you are decorating on your final presentation surface, add a dollop of icing to the bottom and position on stand. If you are using a temporary work surface, use a non-skid mat. Revolving Cake Decorating Stands are a worthy investment, FYI. I also recommend adding small pieces of parchment paper between your cake and surface for easy clean-up. Trim the tops of both of your cakes flat. There are tools that work well for this but I prefer a large serrated knife. Add a dollop of icing to the top of your cake board. Place your first cake right-side down. Add a generous amount of icing in the center. These are the three cake spatulas I use. Working from the center, spread the icing out to edges making sure it overlaps the edge quite a bit. Position your second cake top-down and press lightly. Smooth your filling flat around the outside of the cake. Add a little more if there are holes. You don’t want air in there. Now for the crumb coat. You DON’T want to skip this step. Add a TBSP water to approx 1/3 cup icing. and mix to a loose consistency. Pour most of it on top of your cake and spread it our to the edges in a very thin layer. It’s ok if it runs over the sides, it should. If you need more, add it to the top and push it over the edge. As it spills over the edge, spread it around the side of the cake as shown. You don’t want any holes in the crumb coat for air to get in. Make sure it is completely sealed even to the cake board. Let dry out in the air for at least 1/2 hour or longer. Until it feels a little powdery to the touch. While your crumb coat is drying. Prepare a pastry bag for your accents. Cover your bowl of icing while it sits out so it doesn’t get crusty. Add a portion (1/2 cup?) icing to the center of a square of plastic wrap. Roll it up folding over the seam several times and twisting the ends. You can store these tubes of icing in the fridge for over a week. If you want to firm up your icing, chill it. If you want it softer, leave it out. Roll it up like a cone until all 3 corners overlap making a point at the bottom. Fold the top layers in to secure. Take a coupler top and bottom. Slip the base down into the tip of the parchment cone and twist the cap over the the paper. Tear off the paper tip. Remove the cap carefully, add your pastry tip. In this case a #16. and replace cap. Take one of your icing tubes and cut off the end right below the twist. Slide the open end down into the pastry bag. Fold the edges of the top in and roll the top over. Hold the rolled side towards your hand like so. Ok, so back to the now dry, crumb coated cake. Add a generous dollop of icing to the center of the cake. Spread icing out to edges of cake and over. It doesn’t have to be perfectly smooth yet. Just as with the crumb coat, as it spills over the edges, work it down the sides and push vertically around side. Smooth it a bit, trying to make a nice sharp corner around the edge but being careful not to dig into the cake. Until it looks something like this. Now I personally like a cake that looks like this, a little funky but if you are looking for bakery perfection, carry on. Fill a small bowl with a bit of warm water. Dip your spatula in the warm water and begin smoothing the icing. As always. starting from the center and working your way out, down and around. This can drive you crazy so at some point you just have to stop. Now you can pull out your parchment scraps. Tim to add some decorative accents which will help disguise imperfections. Hold your pastry tip about a 1/4″ from the surface and without moving the tip, squeeze bag until the icing puffs around the tip in a nice little ball. Rather than pulling up/out, swipe the tip over to the side. As you are likely a righty, you are working in the other direction. And keep making these all the way around. It might take some practice. Try a few on parchment paper before you start. Also note that I let the icing cover what was showing of my cake board since I wasn’t moving my cake from this cake plate. Your leftover pastry bag can be stored in the fridge for at least a week or even two. Just remove the coupler cap and pastry tip. add a bit of plastic wrap over the tip and replace cap. So now we can head our separate ways and you can decorate your basic birthday cake any way you want or you can stick around for the Prudent Baby Button Cake. Yes, I know, feeding your baby chocolate buttons might confuse them so maybe this cake is more for mama. Mama can have cake too, ya know! Congrats on your 1 year anniversary. Here's to many more to come. Congratulations! I love the site. I'm here everyday. Thanks for the tips, I've never thinned my icing to crumb coat, it looks like it would be much easier than dragging clumpy butter-cream and crumbs around the cake. I'll definitely be trying that next time I bake a cake. If I have any annoying imperfections on my icing I will sprinkle it with a touch of icing sugar and lay down some plastic wrap, than I can just smooth it out with my hand. or let it chill in the fridge to harden the icing and then get my hands wet and rub any lumps or bumps or imperfections out. I had to do that for my daughters birthday cake, a sculpted caterpillar because I just couldn't get the curves neat with a straight spatula. This looks fantastic! Yay for a tutorial, because I always struggle with icing a cake. Happy Birthday! I love cake. It's a fantastic way to celebrate. Please keep up the excellent blog work because I just discovered you and I need MORE. Wow – you're only a year old? You guys rock! Here is a great tip I learned, I believe from the Almighty Google. 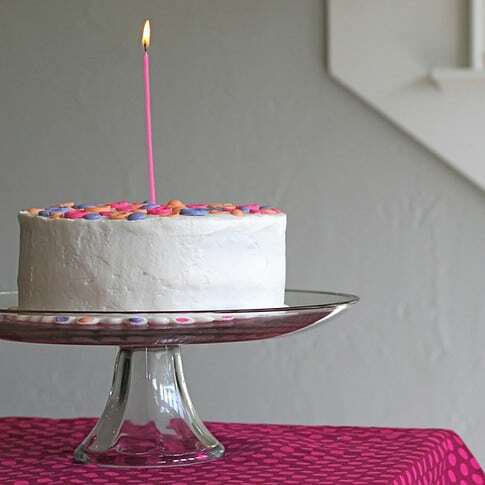 If your cake rises too much in the middle, you can get it almost perfectly flat – eliminating trimming on top and all those crumbs – by wrapping a dishtowel that has been soaked in ice water around the cake pan. I was dubious and thought I would burn the house down – but it worked! Perfectly! I secured the towel around the cake pan with a safety pin. Woah, now that is an awesome extra tip! Thanks so much! I have heard of using a blow-dryer on low to make your icing shiny and smooth but don't remember ever trying it. Something about hair and cake just didn't seem appetizing. Maybe that works too! Another foolproof trick for smoothing out the finish coat is to let it crust over a bit (15 or so minutes, and make sure you're using a "crusting buttercream" frosting), then take a VIVA paper towel (very important that it is Viva as they are the only ones who make a perfectly smooth towel without "quilting"), lay it over a section of cake and lightly use your hand and its warmth to smooth out the frosting. Keep moving the towel around the whole cake, using more pressure as you get a feel for it, until it's as smooth as you like it. Some people claim to achieve a near-fondant-like smoothness–if you like that sort of thing! Great tutorial. Except it makes me want some cake! happy first birthday! I think your blog is surely an early bloomer–no rolling or crawling or walking for you guys–you went straight to running and running fast and winning a place in all of our hearts with your fabulous tutorials and wonderful inspiration to give our children the gift of handmade. you've accomplished a lot this year and we are all grateful! Congrats on one year! I check your blog out EVERYDAY. That's how much I love it. I have even made a few of the things and have passed you on to my friends who are crafty. I do have a tip on the cake. Use the Duncan Hines cake mix and bake at 300 for a longer period of time that it says on the box. Check periodically for doneness. Your cake will be moist for several days to come. I use this especially when I make a cake a few days before the big event. Everyone compliments me on how moist the cake is. No laughing from this momma…I dream of making such a pretty cake…maybe, just maybe, with your amazing tutorial I will reach mission accomplished! Thank you for that, I bet that was a very time consuming tutorial to make! I used to work in a grocery store bakery, making tons of cakes a day. great tutorial, and here are some tips to make life easier in the world of cake decorating. for help with crumbs, get your cake as cold as possible. I freeze mine partially, and it really helps to keep crazy crumbs at bay. finally, great advice on the bottom edge, just an added note, if you want to use really ANY tip, leaf, star, circle, rose, all of them make a cool design with that same exact action. and congrats on 1 year! I can't help but suggest you hide the real buttons from Quinn. She'll definitely think they look mighty delicious as does this cake! thanks for the diy. I am definitely not a perfectionist and like the funky/unfinished look to most things….I think if I tried to smooth out the icing, i would loose it–literally. Plan that vacation-its definitely better than cake. Happy Birthday! I got pregnant with my first about a year ago and found your blog shortly after. I've used your tutorials for just about everything for my little girl's room and clothing. Thanks so much for the inspiration! Happy 1st Birthday! I am not good at icing cakes – so I could use a tutorial on it myself! I am new to your blog – love it! Happy Birthday to the Prudent Baby! This is a wonderful tutorial. I've never figured out how to use a pasty bag and not get icing all over my hands no matter how careful I am. So kudos to you for that amazing idea! Happy Birthday, and thank you so much for these great tips! I cannot wait to try them (and I'm sure my family will appreciate my practice cakes before my son's next birthday). Wow… can't believe this blog is only a year old! Love the tutorial… they never taught us the water smoothing trick in cake class! One thing I did learn is that if you squeeze the bag in place to make your beads, stop squeezing, and THEN left away, you won't get any of those little peaks. thanks for sharing. i was icing a cake for my nephew the other day and it was a hot mess. i wish i had this to follow! The biggest issue I've had with fondant, has been smoothing the layer of icing below it. Thank you SO much for this post! Just started a novelty cake business, so this will help a lot! It makes me want to make a cake right now! Thank you for the wonderful tutorial!! Add WATER to the crumb coat. Brilliant. I never could get a good crumb coat. Can't wait to try that trick!! You didn’t ice it… there is a difference. You. Are. Awesome! This was the first link in my Google search and I knew it’d be great as I use your site for so much. I will try this next time because I had such a hard time icing on my last cake. I actually Googled for a friend today. Glad I did!!! Generally I don’t learn post on blogs, however I would like to say that this write-up very compelled me to take a look at and do it! Your writing style has been surprised me. Thanks, quite nice article. The things they say go to your knowledge from the art you’re. The earth hopes for far more passionate internet writers as you who are not afraid to convey the direction they feel. Always go after your own heart.